I love a gourmet challenge – as you can tell from my latest Vegan Raspberry Macarons. However, you may recall in my latest newsletter that our regional Seine Saint Germain tourist office set me a French culinary challenge – linked to Alexandre Dumas (author of The Count of Monte Cristo, 3 Muskateers…). 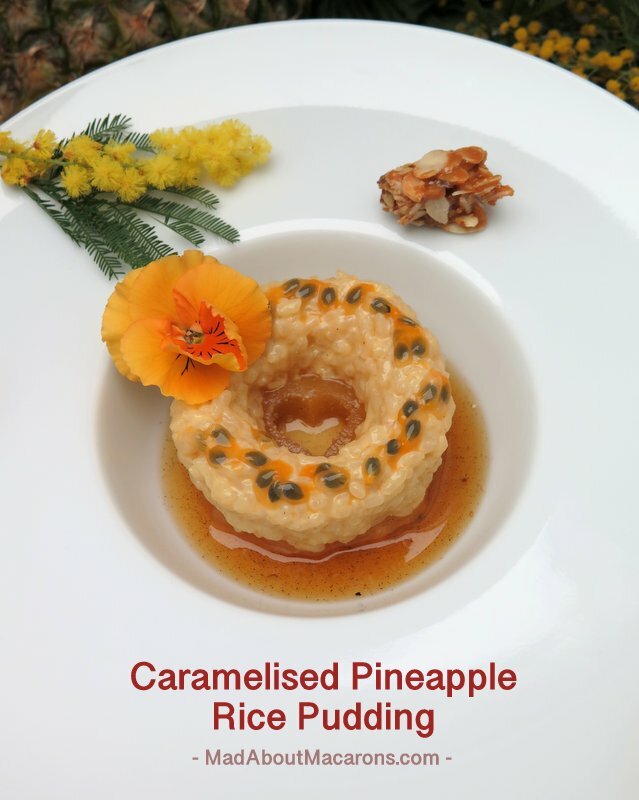 During some initial research, I have discovered a fruity French rice pudding dessert made with pineapple or apricots and, after a twist or two to Ananas à la Condé, have come up with individual desserts to make this Caramelised Pineapple Rice Pudding. What is Condé Rice Pudding (Riz à la Condé)? According to Larousse and other more recent French culinary dictionaries, Condé (or à la Condé) is a chilled entremet (old French for the modern dessert) made of rice pudding cooked in milk, presented in a savarin or crown-like mould and served with poached fruits in syrup. The classic is made either with apricots or pineapple slices soaked in Kirsch and decorated with candied fruits. Why the name, Condé? It refers to the Prince of Condé (aka le Grand Condé), chief subordinate to King Louis XIV and occupied the family’s estate of the Château de Chantilly. The Prince of Condé allured such influental guests as Molière, Racine, La Fontaine and Bourdaloue (a French minister/preacher, who’s Parisian street, rue de la Bourdaloue, is named after him and is where the Bourdaloue Tart was invented – see my recipe here). The Prince of Condé’s butler/chef was the legendary Vatel, renowned for committing suicide since the fish didn’t arrive on time for Louis XIV visit. Did Vatel invent this dish? Who knows, but it certainly wasn’t with pineapple. Pineapples didn’t arrive in France until 1733 under King Louis XV, when they could be grown in the Potager’s greenhouses in Versailles. With 172 years apart, our famous novelist neighbour, Alexandre Dumas, built the Château de Monte Cristo in Port Marly and, as of 1847, held lavish parties centred around the most gastronomic of feasts with impressive wines. Towards the end of his life, Dumas wrote Le Grand Dictionnaire de Cuisine, documenting many of the classic ingredients and recipes around – all of them, no doubt, served at his castle-like demeure in les Yvelines. My challenge is to recreate some of his recipes, although it’s not as easy as I thought.According to a few menus documented in the Chateau de Monte Cristo, he doesn’t even specify many of the desserts (entremets) but cites mainly “Seasonal Fresh Fruit” or a “Basket of Fruits”. The pineapple was the height of luxury as so difficult to come by, and was seen more as a symbol that adorned not just Versailles but the aristocratic homes in the 19th Century. They were so expensive that it was big business – you could even RENT a pineapple to show off. As Alexandre Dumas was most lavish and proud to show off his wealth to his guests, I figure the pineapple is the perfect recipe to kick off my Dumas recipe challenge! Quite by accident, I cut out pineapple love-hearts for Valentines using a small corer. As the corer was a bit too small, I cut out 2 rounds, realising it turned into a heart. No pinks, no ribbons – just a heart that’s hiding secretly, drowned in the most lush pool of vanilla and rum syrup. This recipe classic is normally one large rice pudding, augmented with vanilla and egg yolks to hold its shape, placed in a large crown-like savarin mould and decorated with pineapple slices macerated in Kirsch. In order to boil off the alcohol and make this recipe family friendly, I caramelise pineapple slices in a rum syrup (it’s a variation to this whole roasted rum pineapple recipe), place individual vanilla rice puddings (in mini savarin moulds) on top of a slice of caramelised pineapple and serve with nougatine for added crunchy texture. A French Rice Pudding served "à la Condé" style on top of caramelised pineapple roasted in a rum syrup and topped with passion fruit. A perfect light yet special dessert for any occasion - and a chic way of serving vanilla rice pudding! Caramelise the sugar with a couple of drops of water over a low heat without stirring. Meanwhile, cut the vanilla pod down the middle and scrape out the seeds using a sharp knife (even easier, just add a tsp vanilla powder). Reserve the emptied pods, if using. As soon as the caramel turns a dark golden colour, add the boiling water and vanilla seeds. Stir using a wooden spoon and bring to the boil. Take off the heat and add the rum. Preheat the oven to 200°C/180°C fan/400°F/Gas 6. Prepare the pineapple by cutting off the outer skin with a sharp knife. Remove the inside core using a corer or sharp knife. Place in a roasting tin, pour over the syrup and roast in the oven for 35 minutes (adding the scraped vanilla pod, if using) - coating the pineapple with the syrup a couple of times. Remove from the oven and cool. Meanwhile, while the pineapple is in the oven, weigh out the pudding rice, sugar, milk in a saucepan. Add the vanilla and stir to combine. Cook over a medium heat, half covered, stirring a couple of times during cooking. After about 35 minutes the rice will have thickened. Take off the heat and beat in the 3 yolks and butter. Press the mixture into 6 individual savarin moulds (I use silicone but buttered moulds such as muffin tins will do if you don't have savarin). Leave to cool first then chill in the fridge for at least 2 hours or overnight or transfer for up to an hour in the freezer. Place a pineapple ring in each bowl, turn out the rice puddings from the moulds and place on top. Dribble over the caramelised vanilla and rum syrup and top with some passion fruit seeds. Serve chilled and decorate with an edible flower. Serve with Nougatine to give some added crunch for texture. Never Miss a New Article or Recipe! I hear you, Sherry – and when it’s in an old language it’s often difficult to work out what they really mean. Oh well done, that sounds like a really fun challenge. Loved reading Dumas when I was younger. And gosh, pineapples have been around in France for longer than I’d have thought. Your dessert looks terrific and the thought of caramelised pineapple has got my mouth truly watering. Thanks, Choclette. Looking forward to discovering a lot more about Dumas’s culinary dictionary. You must try that roasted pineapple – last night we had the leftovers of it with the chocolate ginger fondant cake – it was wonderful! Oh my Jill, this Caramelised Pineapple Rice Pudding sounds and looks utterly dreamy! Have never had pineapple with rice pudding before but now I want it! Thank you for the recipe for the Bourdaloue Tart. I missed this post – it looks so good. I bet not many people know that Dumas wrote Le Grand Dictionnaire de Cuisine – so different from his other books. Renting a pineapple – who knew? What a great idea – pineapple love hearts just in time for tomorrow’s Valentine’s Day. Also the caramelised pineapple rice pudding looks absolutely mouth watering. Thanks, Thomasina – I know you’ve visited the Château de Monte Cristo so you know about the dictionary. I am looking forward to sharing photos of this extraordinary place on the next post on the project. So glad you also like the other recipe for Bourdaloue pear tart! We do love pineapple and this looks so great! Adding it to the lists of recipes to try. I really love reading about the history of dishes, so all of your information about Dumas and Vatel were very interesting to me. Also, coincidentally, there will be a bit about the Potager de Roi at Versailles in my Teeny Tea blog post this week, as my tea features a tiny gift that was sent to me from there! Glad it’s added to your list – hope you do make this, even if it’s just the pineapple which is so good on its own too. Look forward to hearing about your teeny gift from the Potager du Roi. I’m intrigued! 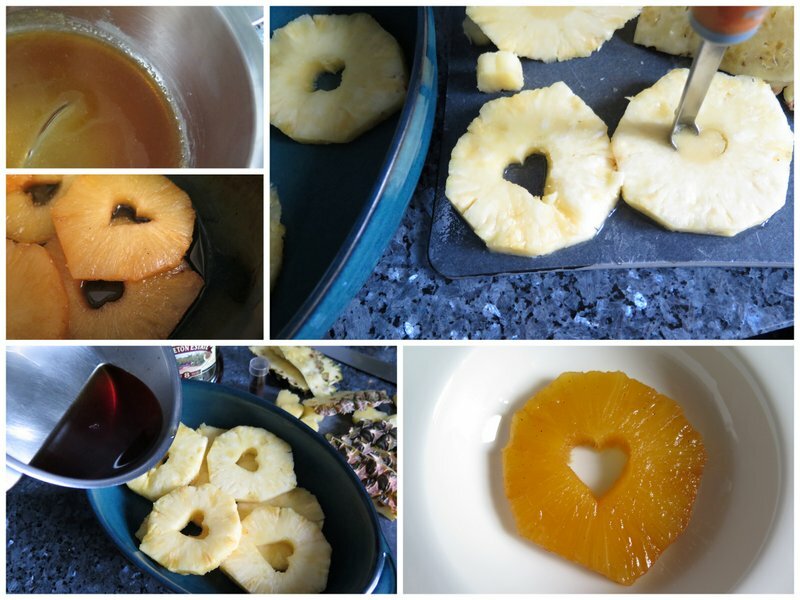 This recipe sounds delicious and I love the fact that you’ve cut hearts in the pineapple slices – It makes this dessert perfect for Valentines day too! I love this recipe and the french literature! Dumas is my youth ! Thank you Jill for introducing me in the world of Alexandre Dumas after so many time! Grace of your recipe and description i remembered so many wonderful things …Thank a lot Jill!! Always a pleasure to follow you! Ooh, I would really like to get hold of Dumas’ ‘cookbook’- looking through old cookbooks certainly does give you insight into how people lived in the ‘olden days.’ In the movie ‘The Favorite’ (now up for an academy award), one of the main characters mentions getting hold of a pineapple in the court of Queen Anne in the early 1700s and what a delicacy it was. Beautiful presentation for your recipe and such delicious flavors! Thanks so much, Fran – I have to see this movie! Glad you’re just as fascinated too. I also love how pineapples were sculpted on entrance gates as a sign of welcome – and that you would be well treated as a guest of the house. I so look forward to sharing much more discoveries plus showing the Château, once the weather gets better again. Oh this looks absolutely wonderful, Jill! I can almost taste that caramelized pineapple! And how cute that you accidentally cut hearts from the rings! The background on Dumas is intriguing! I had no idea he was such a foodie. I just made rice pudding last night and was talking to my parents about the addition of egg. I’ve never tried it, but am scared I might not like it! Isn’t that silly? I do need to give it a try! Thanks, Christina. I love adding yolks to rice pudding – it’s very French! It adds a comforting extra richness and here, for this recipe, I needed to augment the yolks in order for the pudding to set easily in the moulds. Once served chilled, it’s so good. Do try it smothered in that rum vanilla syrup – especially as you grow your own pineapples at home in CA!